The specificity and low search volume of long tail keywords make them less competitive than others. That might put some people off when it comes to SEO, but it shouldn’t. That’s because the vast majority of web searches are for long tail keywords. It’s estimated that around 70% of all searches fall into the category. When all that data is plotted onto a graph, it can be represented as shown above. The graph in question is often called the Search Demand Curve. It’s from this graph that long tail keywords get their name. They are the keywords which comprise the curve’s ‘long tail’ which stretches across much of the x-axis. Keywords at the top of the curve, to the left, are called head keywords and those in between are body keywords. What’s important to remember is that it is not word length which defines a long tail keyword. It is the keyword’s search volume, its specificity and how competitive it is. So far, so simple. Long tail keywords are search queries that are very specific, have low competition and equally low search volume. That’s the theory. As you may have guessed, things aren’t quite that straightforward in practice. Or at least, that’s not the full story. Not all long tail keywords behave in exactly the same way from an SEO standpoint. Or rather, it’s perhaps better to say that they’re not all treated the same by Google and their algorithms. That’s because those algorithms have started to become extremely clever. What that means for long tail keywords is that we need to split them into two main categories. A keyword can be very specific and have low search volume as a result, whilst actually asking the same thing as a very competitive head keyword. ‘What are the best ways to lose weight?’ and ‘losing weight’ are two search terms that can be used to find the same answers. Google’s algorithms are smart enough to recognise this. A SERP generated for the long tail keyword will include pages and sites that rank for the head keyword. Even if they don’t rank for the actual search term entered. That’s because Google knows they will still contain the information the searcher’s looking for. Keywords that do relate to a specific, individual topic make up the other main category of long tail keywords. These are the stereotypical long tail keywords which we described when talking about the search demand curve. They have a low search volume, are very specific and are not as competitive to rank for. SERP results for them will include pages that rank for the specific term and not for a parent topic. When it comes to trying to rank for long tail keywords, these are the ones which it makes sense to target. It should be noted that not all long tail keywords fit neatly into either one of these two main categories. Some fall into a kind of grey area between them. Those which do, are keywords that represent an individual topic but still fit comfortably under the umbrella of a wider subject area. Why Are Long Tail Keywords Important? Now that you know what long tail keywords are, let’s talk about what makes them important. As we’ve already mentioned, they make up around 70% of all web searches. Ignoring all of those searches would mean ignoring a huge amount of possible organic web traffic. That alone would be enough to make long tail keywords important. There are a host of other factors, however, that add to the critical nature of the keywords for SEO purposes. 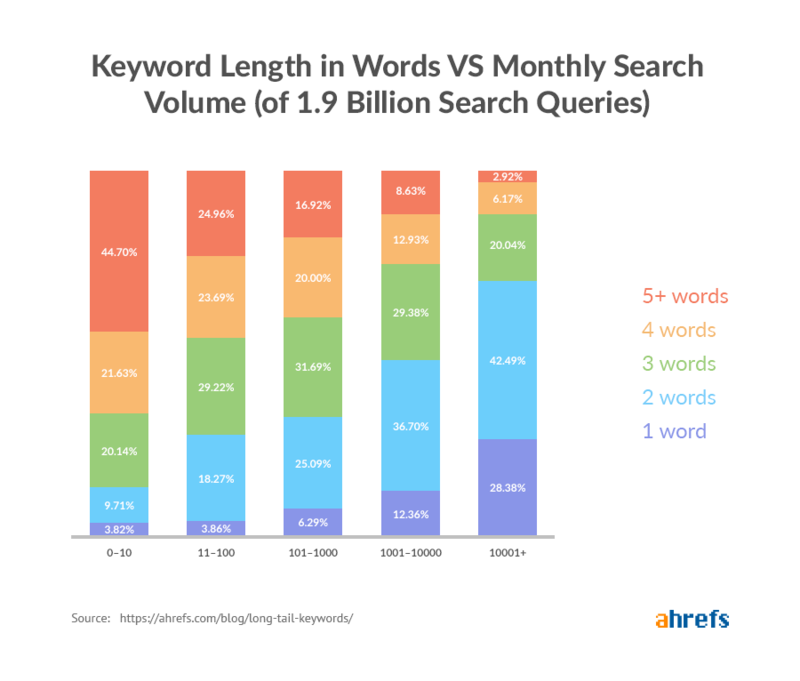 Each long tail keyword represents a very specific search term. That means that each one has a very low search volume. So far, this may seem like a problem, not an opportunity. The opportunity comes from what that means for the competitiveness of the keywords. Each long tail keyword will have little competition to rank for it. That means you can vault up the SERPs for each keyword far more easily. Your content won’t have to be quite as good. You won’t need quite as many backlinks. All in all, it will take less time, expense and effort to get a top ranking for long tail keywords. SEO is not only about getting searchers to find your website or pages. It’s not even only about increasing your site’s organic traffic. It’s also about improving your sales or getting more people to sign up to your services. How well any web traffic converts into sales is something that needs consideration. There’s a reason why long tail keywords account for around 70% of all web searches. They are how ordinary people search the web. If you want to know the answer to a question, you’ll type that question into Google. You won’t search for a topic related to it and then comb through the results yourself. Good SEO takes time and often requires quite a large investment of capital over a long period of time, months – often years. One reason for that is because you need to have a long-term, high-quality content marketing strategy which takes time to research, write, compose and tweak for Google. Your site must continually publish new, original and useful content for users. That means that you need a good supply of different topics and subjects for the content to focus on. Long tail keywords can double as inspiration for those topics. How old is the domain? How long ago was the website first launched? Have you had any previous SEO work carried out? When people use Google what long tail search phrases would you like visitors to use? What top 3 geographical areas are you wanting to target? Heading to Google is a good start. If you begin to type in a topic or keyword, Google’s auto-complete feature can give you a host of other long tail keyword possibilities. Once you’ve hit enter on a search, there are two other places to look for suggestions. If you’ve searched for a question, scrolling part way down the SERP will bring you to the ‘People also ask’ widget. That will show you a number of questions related to the one you searched for. Some or all of them might be worthwhile long tail keywords. Head all the way down to the bottom of the page and you’ll find the ‘Searches related to’ feature. That is yet another list of questions, phrases and search queries similar and related to your original request. In other words, they’re a selection of potential long tail keywords. Analytical tools and processes can help you generate even more keywords to work with. There are loads of free to use keyword research tools that you can choose from. Entering a phrase or subject into a tool like Moz’s Keyword Explorer can produce a whole list of other possible alternatives. Competitor analysis is something else that can help you to find long tail keywords. Analysing your competitor’s pages will reveal which keywords – of any and every type – they are ranking for. Any long tail keywords that they rank for and you don’t are ones which you can look to target. What’s most important about all of the content is that it does answer the intent of a searcher. It must actually address the question or query that they’ve searched for. This is far more important than following keyword-centric guidelines. The natural use of keywords in useful content is more useful than high keyword density. It would be lovely if it was possible to rank all of my clients to Google page 1 for a single or two-word phrase, in reality we need to manage our expectations. Most small businesses don’t have the budget to chase competitive keywords over a number of years which is my I get a lot of contact for Remote SEO Training so that SME’s can learn themselves at their own pace and reduce their costs for SEO. I’m based in Weston-super-Mare and have spoken to clients globally from Thailand to Boston, California to Dublin, Germany to Scotland and of course face to face in Somerset and the South West UK. Shout out to Bristol-based Accelerate Agency who have a team of SEO professionals who service large corporations with a large marketing budget to match, indeed this article is a shortened version of their original longer article here. Cheers guys!